Just a quick post to note that I still find my own personal networked world to be pretty fascinating and amazing. Yesterday I was talking with my wife about a homework assignment Abby had in math where she needed to gather some data. So I threw together a quick Google Form, posted on my blog, and tweeted it out. Now this particular survey and this particular post are nothing earth-shattering, but it again reminds me of how different the world is from when I was growing up; how easy it is to connect with others around the world, and certainly how easy it is to gather data via Google Forms, a blog and Twitter. While I certainly still need to do a lot of thinking about how best to utilize this capability in meaningful ways, I think we all as educators need to be constantly asking ourselves the question, "What can we do now (that is relevant and meaningful for students) that we couldn't do before?" 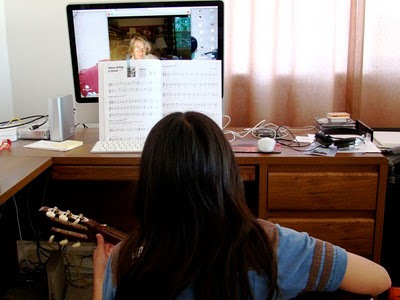 Abby playing guitar for Grandma via Skype. @Re N Vision - I'm going to assume the smiley meant you were kidding but, just in case, Abby also collected data on her own. And, of course, the collection of the data wasn't the point of the assignment for her, it's what she does with it. Just in case. don't forget that you did those amazing videos that brought to you some internet influence. That influence among other humans is the change that made possible so many answers to your (interesting) questions, not the technology itself. While commenter rrr makes a good point about "internet influence", I disagree that influence trumps the technology. An amazing thing about the edtech community is their willingness to share and help. Often that can be something as simple as a re-text by someone with influence or it can be the diversity of choice... blog it, tweet it, facebook it, email it... to find the help that you seek. I totally agree that 'this stuff' can be truly amazing! "what can we do that we haven't already done?" Something tells me that people fifty years ago thought the same thing. When we went to the moon it was mind blowing for the people of that time. When we launched the first satellite, that was mind blowing. When dial up internet was accessible at the home, when the computer was available for the home the list goes on and on. I think to say we are at our limit as far as progress goes is a cop out. A way to say "oh well, good enough." I'm from South Alabama, in Dr. Strange's EDM310 Class, I used my PLN(Personal Learning Network) to help me with a project in the class. My partner and I on this project contacted a few teachers met, and asked if they use podcast in their classroom. So, long story short, the PLN came in handy. I was amazed how quickly they responded to our email. Also, google Docs is very helpful tool to use in many ways. Regarding what Dave Truss and Rrr stated above. It's about both the technology that allows this to happen, AND the "internet influence". If someone like Karl, or Will Richardson or anyone with significant "Internet Influence" posts a question, that person will quickly get results. Twitter, blogs etc are extremely powerful for these people. If I (not having the same influence) post similar questions I of course get less useful results. Most students would be faced with similar results. @Ryan - I'm not in the same category as Will, but thanks anyway. I don't know, I think we can all build our own networks (and we all should), that would get just as good results as someone that theoretically has more "influence" as you put it. I don't think the total number of responses particularly matters as much as the connections you can make. If we help our students build their own networks, I think they will get similarly meaningful and relevant results. Good (and interesting) things tend to spread pretty easily, and if we're intentional about how we connect students with others around the world, they will have those networks to draw on. @diane - Well, that's usually the one I or my wife get to work on, but she gets to Skype on it (and use it when we're not)! We have an old PC from my father-in-law that is her day-to-day computer for now, waiting a little bit longer until I get her her own new one. Karl, I am so glad you did this with her. But I am also dismayed that she's not getting to do this at school. I am currently working on a project with my middle schoolers that is very similar. They had to come up with two variables they believed may be related, determine which was dependent and which was independent, and survey at least 50 people, including 25 or more of their peers at our school. We used to do this with paper and pencil and then type the responses into Excel. Last year, I began having them use Google Forms and Spreadsheets. They LOVE it. I post a link to a page containing links to ALL my students' surveys on a Google Site, then I use Twitter and Facebook to publicize that site. Some of my students have gotten well over 100 responses in just a few days to a week. My PLN isn't huge, but some people retweeted my request, and a lot of friends and family saw it on Facebook and helped out. When we look at ISTE's NETS*S standards, THIS is true authentic learning that happens to involve technology to not only engage kids but also provide results that would be more like what our students will likely face in their careers. This looks like an interesting assignment. I agree it is amazing how far we have come in such a short time. I'm just curious, what did Abby and her class do with the data after they collected it? How did it turn out? Technology in today's society is truly amazing! Being able to communicated to so many in people in places all over the world in such a short matter of time, really shows us all how much technology has changed our world. I bet Abby really enjoyed the results from so many different countries! The modern classroom must change to suit student's needs. Karl- just a quick FYI, I posed the question I go from your blog to my Advanced Computer Applications students, but I had them re-phrase it. "What can your educators do for you now?" in the context of technology. I posed it to be a idea generator. You pose such a thought provoking question. We really must push ourselves as educators to seek out the future tools of our trade and apply them in our classrooms. There are so many tools available to us now, but the nature of technology is that those tools are contantly changing, and at a rapid rate. We have to keep our eyes open to how our students are learning and make sure that we are keeping them engaged with relevant strategies. What you did for your daughter's assignment inspires me to work harder as an educator. Thanks! Hi Karl! I'm a student who is studying to become a teacher. I was really interested in how you used Google Forms, a blog, and Twitter to gather information from people. I think that using the same set up that you used for the survey you could also use to gather information from students and use that data as statics to be used in class. It is crazy to me the opportunities students have today compared to what they had ten years ago. I think it is neat how there are some ways to collect data these days. When I was younger you use to have to call or write someone to get some information on a project you were doing. But, now kids can punch things in computers and even ask questions. on the computer.